Valve was on hand at last night's EA festivities to give attendees a chance to check out zombie survival shooter Left 4 Dead. 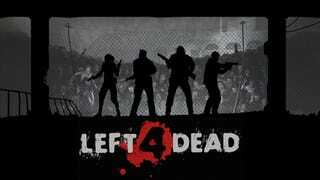 In the game you play as one of four characters co-oping through a city ravaged with a plague of zombies, trying to shoot, melee and run your way from safe room to safe room. The game starts off with your and three other players on a roof top behind a locked door. A nearby table is stocked with a selection of weapons, ammo and health packs. In the map we played, the first room had molotov cocktails, submachine guns, pistols and shotguns. Each player can equip a health pack, molotov cocktail, handgun and primary weapon: I went with the submachine gun. Staying true to the zombie formula, your ammo is very limited, so survival isn't as much about clearing a room as getting through it. After stocking up we unlocked the door, made our way down a set of stairs and were immediately attacked by a dozen or so zombies. The zombies in the game are a nice mix of the ambling Dawn of the Dead variety and the liquid fast 28 Days Later breed. The dead tend to stand around, mill in corners or, at times, crouch in pockets of shadow. Initially when they spot you they seem slow, turning to track you, but most of them got fast once they lock on and either run at you or, on occasion, actually leap across a room at you. While there's a nice mix of zombie animation it became clear early on that certain zombies behave certain ways. Some can be killed with a single shot, others take a full clip to knock down. Some hide, others mill, some bound around the map, others come straight at you. After pushing our way through that first home and onto the streets we wandered around the nearly empty city looking for our way out. In the game, the object is to make it from safe room to safe room, taking the time to replenish ammo and health, on your way to an evacuation point. In my first run through with the game, I made it to the streets before my first-person shooter habits got the best of me and I made the mistake of separating from my team to see if we left any of the undead, not dead. After taking out a straggler or two I realized I was on my own and started to hot-foot it back to the team. Too late. Within minutes the once empty city was crawling with zombies and my last moments were spent standing in the bed of a pick-up truck trying desperately to shoot down the sea of zombies surrounding me with a quickly diminishing supply of ammo. Take two went much better, knowing that we had to stick together and not dilly-dally, we managed to make it to the second safe room with almost no losses, though one of our party was taken down in the room itself before I managed to close the steel door and drop a metal bar across it. After replenishing we made our way into a warehouse where the doors and windows blew open and zombies began to pour in. The seemingly insurmountable odds were evened a bit when one of the other gamers noticed a room blocked off by a wall of sand bags and a mounted machine gun. The three of us stayed in the room fighting off the zombies as the flooded the warehouse. At one point I found a gas can and threw it on the other side of the sand bags. Shooting it, created a wall of flames which slowed the zombie attack, but didn't stop it. Finally we were picked off until it was just me, once more cornered and desperately trying to put off the inevitable death at the undead hands of countless zombies. The game's graphics were amazing, pushing the Source Engine to its limits and delivering plenty of startling moments. The one off-putting thing I noticed was the gallons of blood that pour from you after an attack, it looked like, at times, that characters had a hose attached to their head or stomach, so much blood was pouring out. There are an interesting mix of zombies in the game including a slow, fat thing that projectile vomits blood on you and explodes in a geyser of gore when you shoot them. The balance of the game perfectly matches the feel of most zombie movies and we tended to die when we strayed from the unspoken rules of a zombie flick. Never separate, never slow down, and conserve your ammo.